The APM48 series is an advanced alternating pressure relief system suitable for high-risk patients. The digital controlled pump unit, which provides adjustable pressure and cycle time, is compact and effective in pressure control and management. This alternating pressure mattress system has adjustable cycle time to manage pain and heal bed sores. The pump an be adjusted to cycle every 10, 15, 20, 25 minutes. Adjustable cycles offer flexibility for prevention up to advanced stage 4 bed sore healing. The 10 zone comfort control feature allows the patient to adjust the firmness and softness of the mattress system. 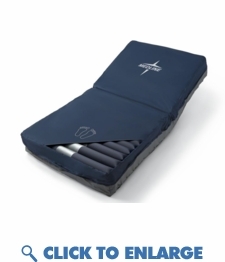 The APM 48 bariatric air mattress offers alternating pressure and low air loss therapy. Low air loss therapy will keep the patients skin cool and dry, preventing heat, moisture, and sweating. Low air loss therapy is an effective therapy to protect the patients skin as the alternating pressure stimulates blood flow and heals bed sores. The patented cell-in-cell design allows the inflation and deflation of air cells to be achieved in the shortest amount of time while providing the good pressure dispersion. Cell in cell systems provide a barrier of protection preventing the patient from bottoming out in the event of power failure. This medical air mattress system is ideal for home care and nursing home use and supports up to 750 lbs 80"x48"x10"
The APM48 series is an advanced alternating pressure relief system suitable for high-risk patients. The digital controlled pump unit, which provides adjustable pressure and cycle time, is compact and effective in pressure control and management. This alternating pressure mattress system has adjustable cycle time to manage pain and heal bed sores. The pump an be adjusted to cycle every 10, 15, 20, 25 minutes. Adjustable cycles offer flexibility for prevention up to advanced stage 4 bed sore healing. The 10 zone comfort control feature allows the patient to adjust the firmness and softness of the mattress system. The APM 48 bariatric air mattress offers alternating pressure and low air loss therapy. Low air loss therapy will keep the patients skin cool and dry, preventing heat, moisture, and sweating. Low air loss therapy is an effective therapy to protect the patients skin as the alternating pressure stimulates blood flow and heals bed sores. The patented cell-in-cell design allows the inflation and deflation of air cells to be achieved in the shortest amount of time while providing the good pressure dispersion. Cell in cell systems provide a barrier of protection preventing the patient from bottoming out in the event of power failure.